Flash Prince Of Persia | OhGizmo! 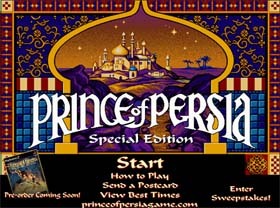 This is probably older than the primordial protoplasmic protozoa, but I think it’s durn cool: Prince of Persia in Flash. I remember playing this stuff eons ago, and feeling so stupid for sucking so bad. Eh… I loved it anyway. Here’s the link, but be warned it goes directly to the game. Story VIA Digg.